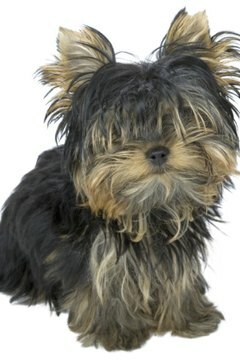 Yorkshire terriers, often known as "Yorkies," are a breed of small lap dog. It has characteristics such as a zeal for exploring the world and sometimes becoming territorial over its owners. The dogs can also have sensitive stomachs on occasion, so if your Yorkie has a problem in this area there are things that you can do to help it eat better or more regularly. If the problem persists no matter what you try, take your Yorkie to its veterinarian to rule out more serious conditions. Feed your Yorkie dry dog food, sometimes known as kibble, that has a high nutritional content. Read the label to find out this information and make sure that the first two ingredients are meat. Do not buy food that contains corn or soy beans and make sure that the food was inspected and passed by the USDA. Avoid fillers, artificial preservatives or by-products as well. All of these ingredients can irritate a Yorkie's sensitive stomach, aside from being less nutritionally sound than other types of food. Change to a different brand of dog food if your Yorkie is experiencing problems with its current brand. Try two to three brands before taking your dog to the vet to see if there are any underlying reasons why it is not eating properly. Add a small amount of beef broth to the dog food to make it tastier for your Yorkie to eat. Yorkies have sensitive palettes as well as stomachs and your dog may simply be a picky eater, requiring extra flavor in its food. Feed your Yorkie twice per day at the same times. Yorkies, as well as most other dog breeds, prefer a set schedule that is reliable. This helps to calm its nerves so that it eats better when food is available. Do not feed your Yorkie scraps from the table, as this can cause irritation in its stomach. Can It Hurt Your Gerbil If You Give It Mice & Rat Food? If the Dog's Ribs are Showing What Should I Do?